Ever since the Leader of the Indigenous people of Biafra came to challenge the decades old Nigeria's oppressive rule of the old eastern region that seceded from Nigeria in 1967 following well calculated genocides meted against them by the Hausa/Fulani Islamic oligarchy, demanding for the restoration of Biafra, some respective ex-presidents of the enclave who are beneficiaries of the age long oppressive rule have been very uncomfortable. They go about mobilizing paid supporters to fight against Biafra restoration, calling Nnamdi Kanu *a criminal" and slamming false charges against him , thinking he has been silenced. Little did they know he was given a boost and international attention. The court of law they dragged Kanu to even on three separate occasions squashed the case and ordered for his bail and release. Buhari the Fulani Islamic jihadist whose main purpose of coming to power was to crush the remnant Biafrans who survived the 1967-70 pogrom, became irked over the competent court decision and used his political power to unlawfully cage an innocent man in prison for close to eight calendar months now. He has been boasting ever since in his presidental chat that Nnamdi Kanu will not have his freedom because he could leave the country since he has dual citizenship, thus prejudged Kanu before hearing him in court. Read also:NNAMDI KANU AND THE REASON BEHIND THE "IT'S EITHER BIAFRA OR DEATH" SLOGAN. But the judges that heard Kanu's case before the now double standard John Tsoho, saw virtually nothing in Kanu's call for restoration of Biafra since it is in line with UN Charter on the right of the Indigenous people. But Buhari would not hear of this. He still bragged on in his recent statement during a visit to his home town that he will rather die than seeing Biafra having its freedom. It is interesting to note that Buhari in his said speech, has thus condemned himself with his own mouth and may it happen to him as he said, speedily soon! In every civilized world, the call for political freedom is always welcomed with open hand, and the result of this is the emergence of new countries in line with the UN Charter. But African leaders would not hear of this and would rather die than seeing it happening. They like political subjugation and take pride in seeing people especially those they tagged "infidels" suffering as Benjamin Adekunle, a Nigeria genocidist told the world: "I want to see no Red Cross, no Canitos, no World Council of Churches, no Pope, no missionary, and no United Nations Delegation. I want to prevent even one Igbo from having even one piece to eat before their capitulation. We shoot at everything that moves and when our troops march into the centre of Igbo territory, we shoot at everything even at things that don't move." From this single utterance you now understand the Nigeria intention of fighting Biafra was and is still - to CAPITULATE THEM! It is on record and even more that the very issues that led to the civil war are still happening in Nigeria. Political slavery policies such as federal character, godfatherism, unbalanced states creation, local government subjugation under states, ethnic hatred of Biafrans not only by the Hausa/Fulani jihadists, but by some others like the Igbira, and so many other burning issues that have been swept under carpet simply because it concerns Biafrans. Apart from this are gross neglect to adequately develope the oil producing areas where Nigeria leaders makes their trillions before leaving office. It is in order to keep those oil producing communities in perpetual slavery and in order to continue shaping their God given resources that irked them to hold Nnamdi Kanu unlawfully in prison. If not, how will you explain the fact that new countries have peacefully and quietly emerged in other places of the world, only in Nigeria is it seen as a taboo, rebellion, and even the (Nigeria's)misnomer "treason" and "felony" charges they can not prove. With all this compounded together, it can be clearly seen that Nigeria is simply fighting unjust war to keep us slaves perpetually, even when there is existing document showing clearly that NIGERIA EXPIRED IN 2014! What other evidence do we need to know that the political beneficiaries of Nigeria who are mostly the Islamic Northerners want us to remain slaves for ever? It is therefore in our hands to say no to this evil plot and to stand our ground in demanding for immediate restoration of Biafra, the only hope of Africa. Let the communities, Associations, Clubs, Parties, individuals and cooperate bodies who have not joined IPOB for the restoration of Biafra do so now. It is said that unity is power and the more we come together as recently advised by Asari Dokubo, the easier it becomes to get our freedom. We must get Biafra, yes we can and nothing, not even the empty threats of the Northern Islamic jihadists, nor their unproven "felony" can stop us from getting Biafra. 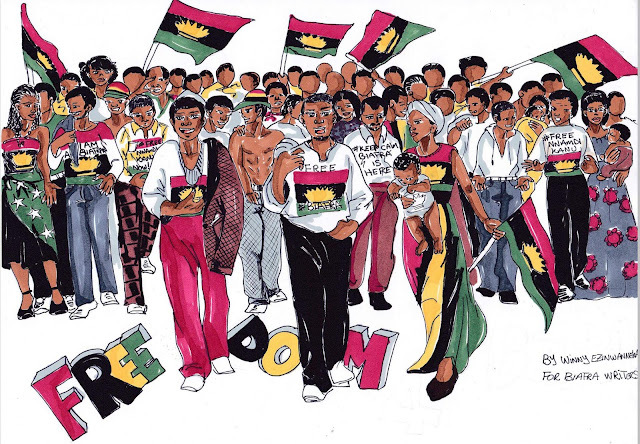 Biafrans be strong!